Both NASA and ESA space missions have just released new videos plotting the orbits of tens of thousands of asteroids (and comets) orbiting our sun. The study of asteroids has come a long way in recent decades, especially since astronomers realized that Earth is more or less at the center of a cosmic shooting gallery, in which asteroids are the bullets and we’re the target. Fortunately, this shooting is happening over a fantastically long timescale, with the biggest asteroids easiest to spot, so that – for example – astronomers now know there are no world- or even continent-destroying asteroids headed our way, anytime soon by human standards. Yet small asteroids sweep within our moon’s orbit all the time, sometimes weekly, certainly monthly. You can now subscribe to the Daily Minor Planet to see how often, in real time. The relatively new awareness of asteroids’ potential for harm is why astronomers have turned up their scrutiny of asteroid orbits and why – within the past week – both the European Space Agency (ESA) and NASA released new videos, based on spacecraft observations, showing asteroids orbiting our sun. The NASA video and animation – above and below – plot the data gathered during the first four years of NASA’s NEOWISE or Near-Earth Object Wide-field Survey Explorer mission. NEOWISE has spotted and characterized more than 29,000 objects since December 2013. Most of those are asteroids in the main belt between Mars and Jupiter (gray dots in the visuals above and below), but the total includes nearly 800 near-Earth objects (NEOs, shown as green dots in the visuals) and more than 130 comets (yellow squares), mission team members said. And you might see that the study of asteroids is laborious, to say the least. NASA said that NEOWISE acquired more than 2.5 million infrared images of the sky during its fourth year of operation. Scientists combined these data with the year one through three NEOWISE data into a single publicly available archive, containing approximately 10.3 million sets of images and a database of more than 76 billion source detections extracted from those images. So you see there’s a lot of stuff out there, but – in a word of caution as you review the NASA video and animation above – it’s good to remember that space is vast. These visuals make it look as if the asteroids (the gray and green dots) are almost touching each other, and that’s an unintentional misrepresentation, caused by the fact that the scientists are trying to show you thousands of objects on your tiny computer screen. In fact, if you were traveling through the asteroid belt in a spacecraft, you’d hardly be dodging asteroids, as sci fi movies like the one above love to depict. Instead, you’d be hard-pressed even to see an asteroid because, well, as you might or might not appreciate, there’s just lots of empty space out there. 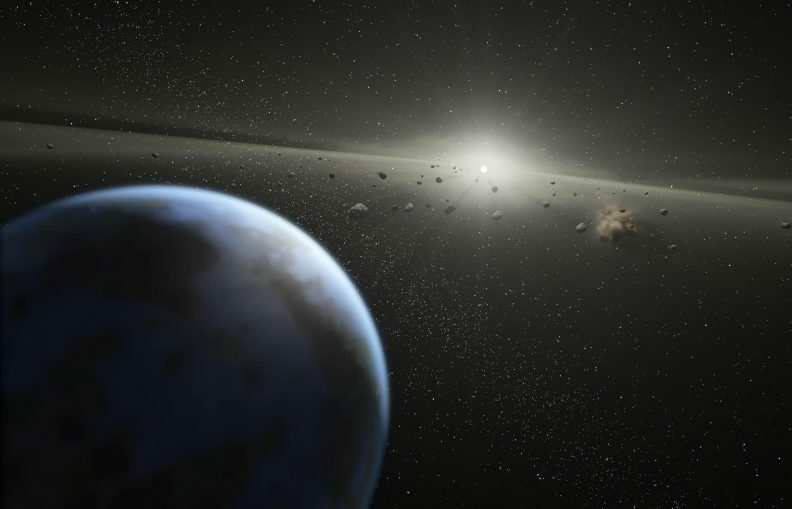 That why – when asked if a spacecraft could travel through the asteroid belt safely – Sophie Allen of the UK’s National Space Academy answered that the chances of a collision would be about one in a billion. Personally, I prefer the ESA video above to the NASA depiction because it doesn’t convey that false idea so completely, that the asteroids surrounding us are so densely packed they almost touch (they aren’t densely packed at all). The ESA video – released April 25, 2018 – is an animated view of some 14,099 asteroid orbits. The data came from ESA’s Gaia satellite’s second data release. The orbits of the 200 brightest asteroids are also shown, as determined using Gaia data.